Put simply, Mad Max: Fury Road is one of the best post-apocalyptic films ever made. Set in a dystopian world where gasoline and water are rendered scarce following a nuclear holocaust, it follows Max Rockatansky as he tries to help Imperator Furiosa and her companions escape from cult leader Immortan Joe and his army, leading to a lengthy action-packed road battle. One of the things that made this fourth Mad Max instalment such a hit is the car design. Using scraps taken from other vehicles as well as other wacked up metal parts, they manage to produce some of the most insane-looking cars you’ll ever see. Just take a look at the four examples below to see what we mean. The MFP Interceptor is Max Rockatansky’s signature ride, appearing first in the 1979 film. It was briefly shown in Fury Road before getting stolen by the War Boys. It would not appear again until about two-thirds into the movie, where it’s been heavily modified and weaponized to fight against its owner. Eventually, though, it gets wrecked between two other larger vehicles. The car model from which the Interceptor is based hasn’t changed much; it’s still the 1974 Ford Falcon XB GT Coupe used in the first film. It was also given a rusty and dirty look so as to make it appear like it’s from a dystopian world. This big, bad baby is driven by no other than Imperator Furiosa herself. This has got to be the largest vehicle featured in Fury Road aside from the People Eater, measuring in at 78 feet in length. The skeleton arm design on the driver’s door reflects the condition of the owner as Furiosa is missing her left arm. One of the most notable features of the War Rig is the unique kill switch devised by Furiosa herself. In order to prevent thieves, a series of switches need to be flipped in a specific order for the tanker to start. In addition to this, the vehicle also has tons of weapons (both hidden and shown) as well as a secret trap door to hide people. In many ways, the Gigahorse resembles a customized Cadillac Monster truck. However, it’s unique because it’s actually built from scratch. It was created by using a couple of 1959 Cadillac Coupe de Villes that were welded together with one sitting atop the other. It measures a four meters in height—and that’s not yet including the flags. Another eye-catching feature of this car is the huge tractor wheels that serve as its rear wheels. This odd-looking ride is driven by Immortan Joe himself in his quest to get back his “property.” It was eventually commandeered from him by the protagonists, and, surviving the road battle, was taken back to The Citadel. It would be an absolute sin to leave out the craziest vehicle to grace Fury Road. Meant to be George Miller’s little drummer boy, it turned out to be the biggest little drummer boy ever designed. We bet rockstars wish they can order this vehicle because this would be the best mobile platform to perform in. And as if that’s not enough, you have the Doof Warrior in front swinging from his bungee cord and playing a flame-throwing electric guitar like the nutso! 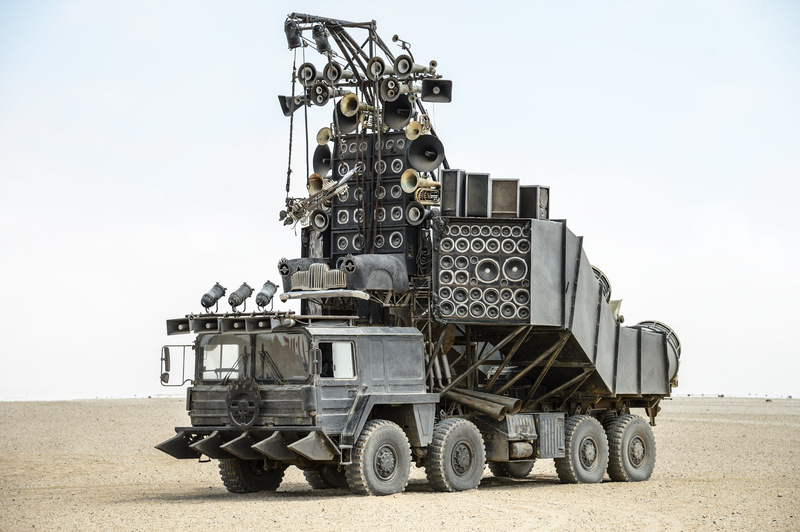 This mad medley of stage and wheels is equipped with tons of speakers to amplify the Doof Warrior’s rad shredding. Everything is supported by a huge, modified 15 ton eight wheeler. If you think these four rides are insane beyond measure, then you should see the rest of the customized cars featured in Mad Max: Fury Road. And with at least a sequel coming up in the near future, you should expect more crazily designed set of wheels soon.